In the first decade of the 20th century, Manchester United played their home matches at a 50,000-stadium at Bank Street, when then president Davies began planning for a new stadium with double that capacity. A site was chosen near Trafford Park industrial estate, and architect Archibald Leitch was appointed to design the stadium. 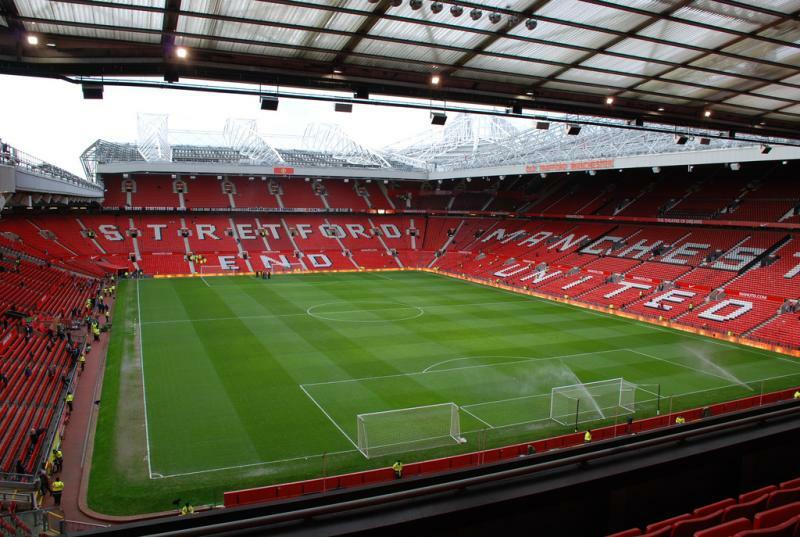 Old Trafford officially opened on 19 February 1910 with a match between Manchester and Liverpool (3-4). The stadium at that time consisted of one covered seating stand and open terraces on the other three sides. Capacity was slightly over 80,000. 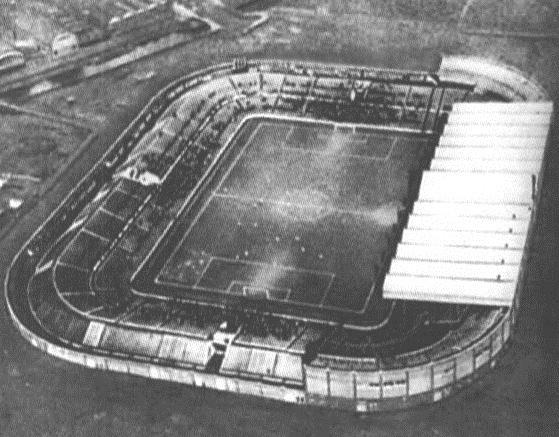 Few changes were made to the stadium until the construction of a roof over the United Road terrace in 1934. In 1939, Old Trafford recorded its highest attendance of 76,962 during an FA Cup semi-final match between Wolves and Grimsby Town. Due to its proximity to Trafford Park industrial estate, Old Trafford got heavily damaged by German air raids during World War 2. 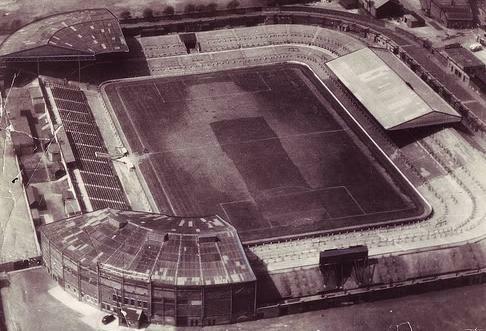 It took eight years to rebuilt the stadium, the delays being caused by limited post-war resources, and during that time United played at Maine Road, the ground of rivals Manchester City. 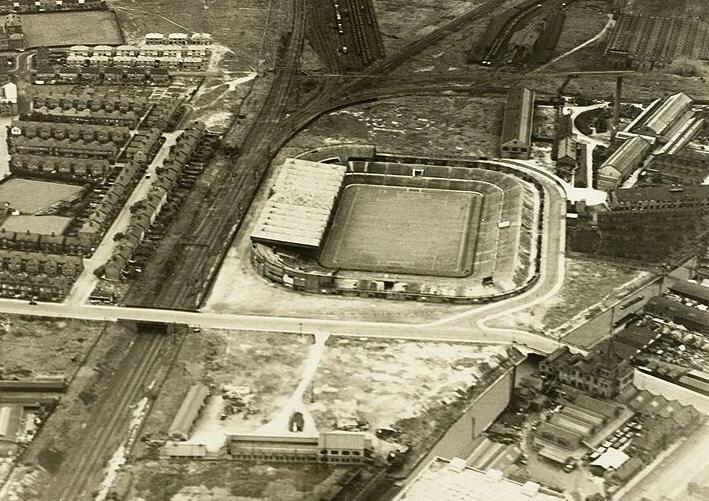 In 1949, Man United moved back to a reconstructed, though smaller, Old Trafford. 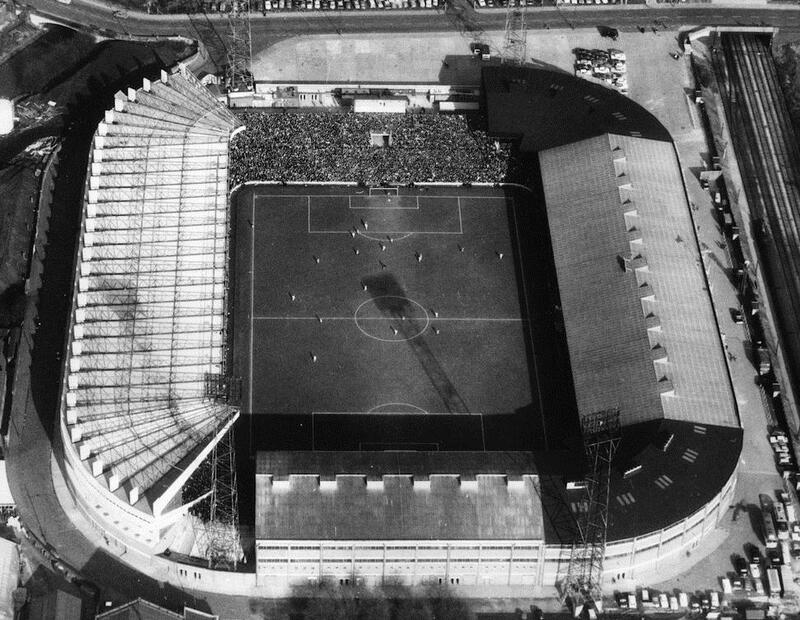 Incremental improvements and expansions were made in the following decades, which culminated in the complete renovation of the United Road (North) Stand in the 1960s. This stand also held the first private boxes to be constructed at a British ground. Old Trafford was one of the playing venues of the 1966 World Cup, during which it hosted three group matches. In those years, the capacity of the stadium fluctuated around 60,000. 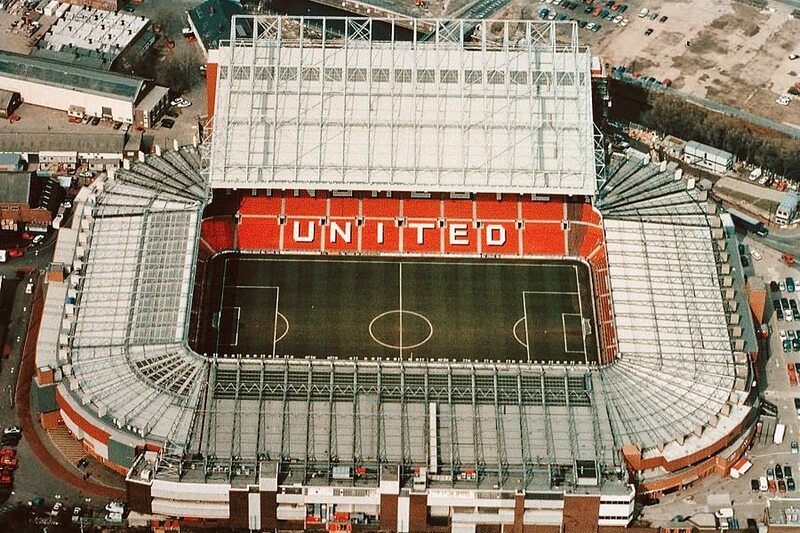 Old Trafford got gradually further improved in the 1970s and 1980s, including new and better cover, increased seating areas, and improved executive facilities. At the same time, however, the rise of hooliganism also resulted in the installation of security fences separating the stands from the pitch. In the early 1990s, plans were made to convert the stadium into an all-seater. This involved the demolition and replacement of the famous Stretford End terraces and the placement of seats in the lower-tiers of the other stands. 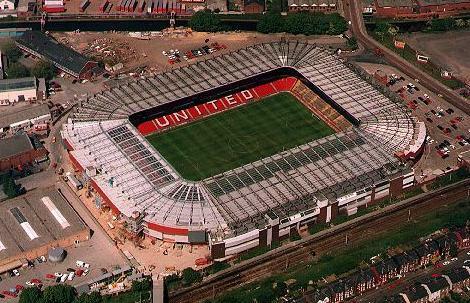 Old Trafford got selected to be one of the playing venues of the 1996 European Championships, and as a result a new North Stand opened in 1995. By the start of Euro 1996 the stadium could hold about 56,000 fans. During the Euro 1996 tournament, Old Trafford hosted three group matches, a quarter-final, and the semi-final between the Czech Republic and France (0-0). 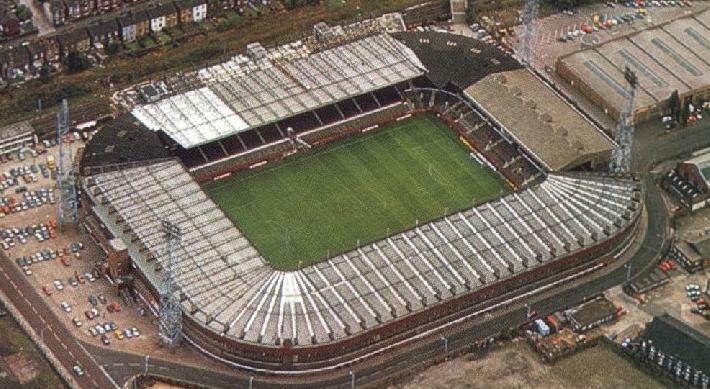 In the years following, second tiers were added to the East and West Stand, raising capacity to 68,000 seats. In 2006, the stadium reached its current capacity when stands got built in the upper-tier corners on both sides of the North Stand. Old Trafford hosted its only European final in 2003, when the Champions League final between Milan and Juventus (0-0) was played at the stadium. In 2011, the stadium’s North Stand got renamed Sir Alex Ferguson Stand in honour of the club’s long-time manager. Old Trafford’s South Stand remains the only two-tiered stand of the stadium, but expansion possibilities are limited due to the railway line that runs behind the stand. While Man United has indicated that a further expansion to 95,000 seats remains a possibility, no concrete plans exist at the moment. On matchdays a special train service is provided from most Manchester city centre stations to Old Trafford Stadium rail station. 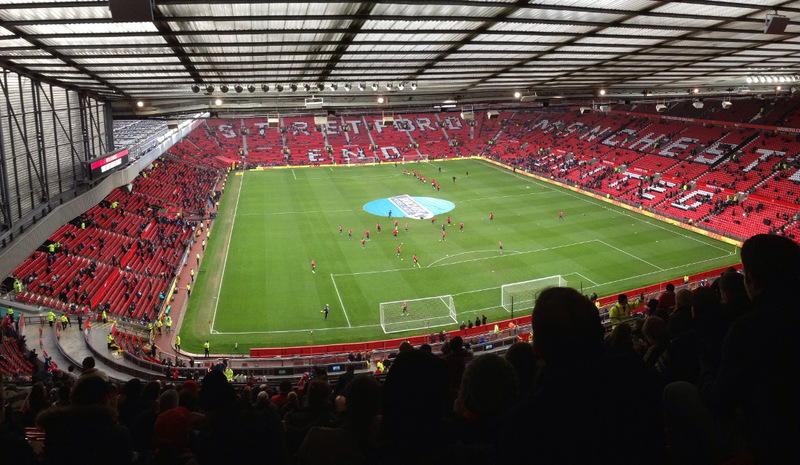 Old Trafford is located in an area that is a mix of residential housing and offices and light industry. The area lacks excitement, though there are a good few hotels around if you wish to stay close to the stadium. Hotel Football Manchester, backed by a number of former United players such as Gary Neville and Ryan Giggs, lies right next to the stadium and gets great reviews. Chesters Hotel, Victoria Warehouse Hotel, and Premier Inn are also at short walking distance and somewhat cheaper. There are also various hotels a little further north around the quays, which includes such chains as Ibis Budget, Ramada, and Holiday Inn Express. 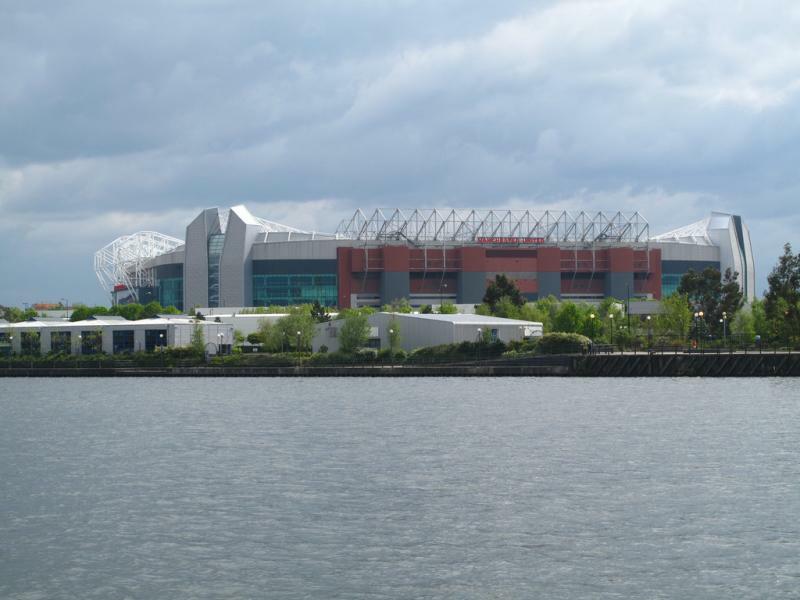 For an overview of all hotels near Old Trafford click here. There are naturally also many options in Manchester’s city centre, a short Metrolink journey away, though these hotels tend to be a little more expensive. The few pubs close to the stadium fill up quickly on matchdays, which is good for the atmosphere, but if you want to sit down for some food, it may be wiser to do so in the centre. In particular the Deangate Locks and Castlefield area are perfectly situated on the Metrolink. Tickets for Manchester United games can only be bought online. Match tickets for league games tend only to go on sale for club members. The cheapest membership in combination with a ticket costs £20.00 per year. 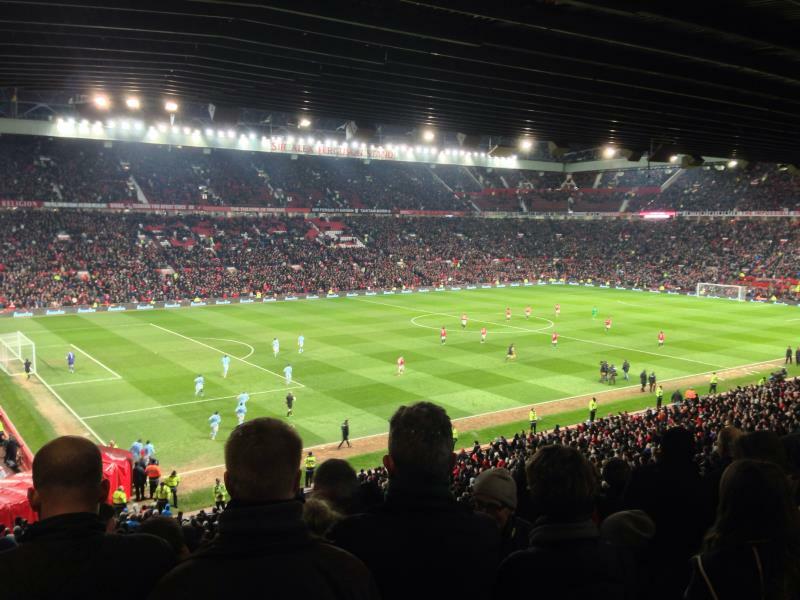 Even though Manchester United almost always play for a full house, tickets for games against lower-profile teams will often be easily available for club members if bought in advance, especially for seats at the upper tiers. 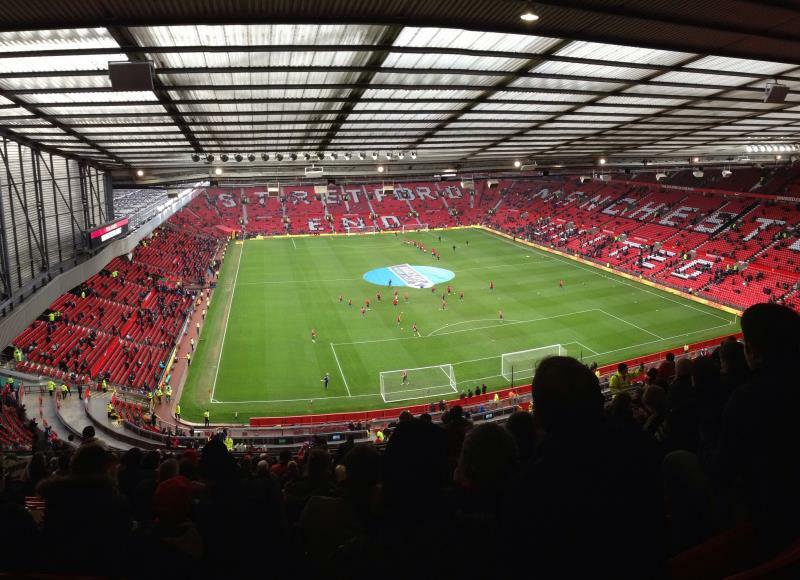 Ticket prices range from £31.00 for a lower-tier seat behind one of the goals to £53.00 for a central seat at the Sir Alex Ferguson or South Stand. You can find a seating plan here. Call +44 (0) 161 868 8000 for more information. Manchester United organise guided stadium tours that include the dugouts, players tunnel, and the Manchester United Museum. The tour lasts about 70 minutes, which does not include time spent in the museum. Tours run seven days a week except matchdays and only run until 1:00 pm the day before a European home match. Tours run about every 30 minutes between 10:00 am and 4:30 pm, but opening times and frequency depend on the season. The museum is opened from 9:00 am to 5:00 pm, but closes on weekend matchdays and three hours before a non-weekend match. Pre-booking of tours is not required, but highly recommended as limited places are available and tours particularly sell out the day before and after a home game. Bookings can be made online. The tour costs £18.00. For more information call +44 (0) 161 826 1326 or email toursenquiry@manutd.co.uk. Manutd.com – Official website of Manchester United FC. Metrolink.co.uk – Information on the Metrolink transport system. i have been been to old trafford twenty times for matches/tours and i have to say it was an excellent experience.the last time i went i brought my two sons and my partner and we had an amazing time.we travel from ireland at least once a season.the stadium is amazing. Been to Old Trafford on a number of occasions. But for all the money the club boast about making. I find they spend very little on the stadium. Very poor quality compared to some of there rivals in the Premiership & around Europe. Should think more about the comfort of the fans than the profit the share owners make. When my family went there the ticket for the stadium tour sold out already and they offered us stadium looking which half the time but only 4£ less than the original stadium tour price (original stadium tour £18, stadium looking £14). I’ll tell you it is not worth your penny at all. You only get to see the stadium for 8 minutes with 5 minutes spent from the person doing unimportant chit chat or insignificant information regarding the stadium that they didn’t even come up with (they had to be asked to tell us the information). And then, after the unimportant chit chat, they only let us to take pictures for 3 minutes! With the Old Trafford person kept mentioning we don’t have much time, as if hurrying us to go! When I asked for a help from the guide to take a picture of us, at first he was saying there was no time at all to take a picture but he said, “Okay, just one picture”. And my father clearly asked him for help to take our picture with the Old Trafford Stadium writing on the back and he was saying a nonsense reason, “I’m not used to this kind of camera.” He didn’t need to do anything technical with that camera, it was only pointing to a good angle of four people standing with the field as the background and Old Trafford writing on the back and he can’t even do that?! After that he basically asked us to leave the field (bare in mind it was only 3 minutes after they let us started to take photos and we were the last slot of the day which meant they weren’t hurried by another slot coming in) and I complained but that guide just didn’t give any care whatsoever. Such a horrible, horrendous service from the guide. It was awful and I can say myself, the worst day of my summer because I expected so much from this great football club stadium service. But basically they only want money and don’t care if people is a fan or not. If they offer the stadium looking only, better not take it, it’s better to take the whole package of the stadium tour. I went to Old Trafford 10 times so far. Great place to watch football. I am a fan of Manchester United and try to go at least one a year. There is a lot of parking options around the stadium. Tickets are usually available to members for most games. Excellent pitch, nice dugouts and dressing room as well. Superb tunnel exit through tiers,a way also sitting in the manager’s sit (sir Alex Ferguson).confort seats headed around tiers.lastly Best among the Rest. Me toco estar en un juego en el Old Trafford en Febrero del 2007. Primero fue un verdadero reto comprar los boletos, segundo ver la guardia montada cada 5 metros me pareció muy interesante. Cuando termino el partido y viaje de Trafford hacia Manchester… iban aficionados en el tren cantando glory glory man united!!! fue una experiencia mitica! Exciting tour of stadium with minute interesting details.I have been to Manchester more than once and this stadium.Colorful and nostalgic memories.Thanks for good job. Excellent tours of both the stadium and dugouts/dressing rooms. You even get to walk out from the tunnel and sit in Alex Ferguson’s seat. The museum is one of the best around, and the Red Cafe is excellent. The shop is good too.